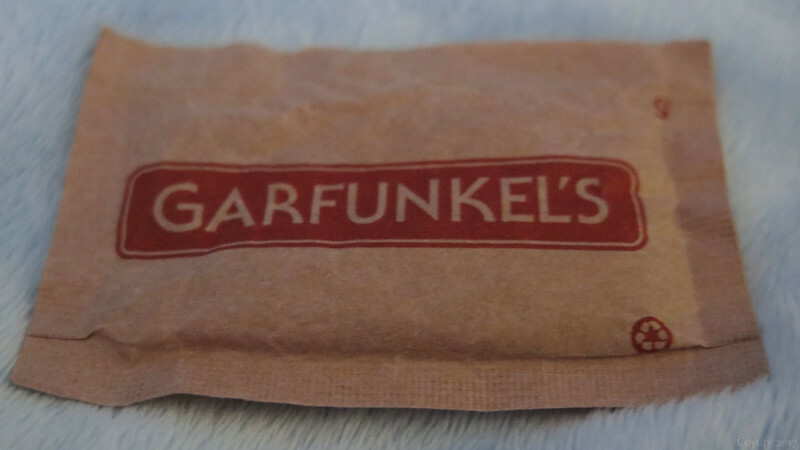 Souvenir from Garfunkel's, a restaurant in London's Piccadilly Circus. I wanted to have it sitting on an image of Mary Poppins, but couldn't get the lighting right. I ate at Garfunkel's right after an apparent bomb threat in Piccadilly Circus in August 1998, and perhaps during it. I had just been taking a photo of one of the square's statues and when I looked around I found I was in the middle of a taped-off area. For some reason the police didn't notice me there in plain sight. Troops were marching into the square and I quickly got on the good side of the tape. Police were pushing everyone further and further back from the area, and when I asked an officer how far we should go, he said, "It depends on how much you want to live." They stopped pushing just before Garfunkel's, and it was supper time, so I supped there. The staff told me bomb threats were a common occurrence and everyone had a sheet of questions to ask anyone calling in with a threat. I couldn't find anything in the news about the incident afterward. I was in London for the Babylon 5 Wrap Party. Harlan Ellison served me black pudding in his pajamas there, and I got to put a tipsy James White to bed one night. The statue photo was the last one on the roll and didn't turn out, of course.